Informally, this set is the set of all characters used as lowercase letters in alphabets that make case distinctions. So I wrote a method that prints out all the characters inside an NSCharacterSet and passed the characters in lowercaseLetterCharacterSet to this method and guess what characters I got? Here is the screenshot of my console output. I hope this will help you save hours of head scratching. The transactionReceipt property of the SKPaymentTransaction class in StoreKit framework in iOS SDK is of type NSData and Apple isn’t very eager to tell us what it contains and what format of data it is in. However, Apple provides a service through which you can verify if this data is valid or not. The process is explained in In-App Purchase’s Verifying Store Receipts page. But to make things easy, I have created an iOS SDK 5.0 compatible class which will do this for you. All you have to do is to pass the NSData transactionReceipt of an instance of SKPaymentTransaction to this class and wait for the response to come back. I’ve named this class “SKTransactionReceiptVerifier” and you are free to use it in your projects or modify it to suit your needs. You can download “SKTransactionReceiptVerifier” by clicking on this link. I hope this will help save your time. I have posted all the example codes from iOS 5 Programming Cookbook, on GitHub. Check it out here. Enjoy. Have you come across this problem? I managed to find the issue. The problem is with LLDB. 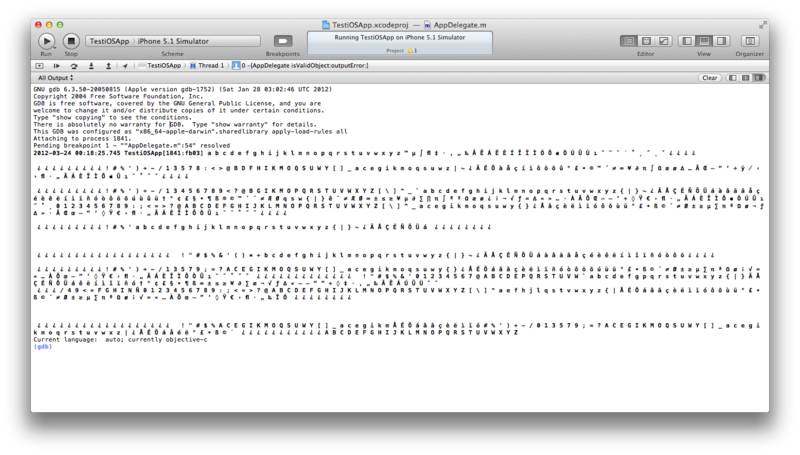 LLDB is the default debugger which Xcode 4.3.1 chooses for every new iOS app. Once I changed my debugger from LLDB to GDB, I can run and debug my iOS apps on iOS Simulator. I hope this will be of help to those facing the same issue.